One Million Solutions in Health and Choices & Patterns Share Research about Type 1 Diabetes – What Does it Take to be in Control of Blood Sugar? Dr. Stephen Duck, a pediatric endocrinologist, who specializes in treating diabetes in children, will share research about Type 1 Diabetes to help people understand what it takes to be in control of blood sugar. The key to a healthy life with Type 1 Diabetes is to be in control, and glucose control involves at least three distinct areas. One Million Solutions in Health and Choices & Patterns know that Type 1 Diabetes can be difficult to manage. Consequently, sharing this research about "Type 1 Diabetes – What Does it Take to be in Control of Blood Sugar?" via a webinar with Stephen Duck, MD, Director of Pediatric Endocrinology, NorthShore University HealthSystem and Gerene Schmidt, MA, BSPHN, RN, President/Co-Founder, Choices & Patterns, Inc. is important to help those individuals with this condition. Type 1 Diabetes: What Does it Take to be in Control of Blood Sugar? 1. Insulin Replacement – This includes choosing the type of injectable insulin and the method of delivering the insulin. 2. Blood Glucose Monitoring – This area covers the method of measuring insulin levels and the intensity of measurements. 3. Pattern Management – The third and most critical part: pattern management. This has often been the domain of the health care team, which knows that current techniques are not ideal. The goal of this webinar is to empower people with diabetes. 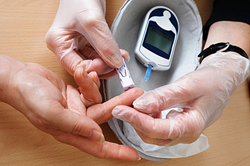 It is important to understand how to optimize blood glucose control. Dr. Stephen Duck outlines the issues and discusses current techniques that are essential for a patient with Type 1 Diabetes to succeed. Review the webinar here: "Type 1 Diabetes – What Does it Take to be in Control of Blood Sugar?". As a not-for-profit, the goal of One Million Solutions in Health™ is to shape health care by sharing solutions and, importantly, to accelerate the discovery, development and delivery ... of innovative cures, treatments and preventative measures for patients around the world. By facilitating efforts to ensure organizations can Connect, Learn + Share, Innovate and Collaborate, our vision is to improve health care delivery, accelerate life sciences research and share patient and consumer-focused ideas and solutions. By engaging scientists, entrepreneurs, investors, innovators, industry experts, health care professionals, and patients across various disciplines, and from around the world, we can utilize the power of the internet to disrupt things in a positive and transformative way to accelerate the movement of new solutions and scientific discoveries from the scientist to the patient. The Technology Evaluation Consortium (TEC) brings together life sciences and/or health care companies and technology providers, and other relevant partners (e.g., government and Universities) to evaluate and validate technologies or services in a collaborative environment. The model empowers technology providers and industry end users to collectively assess a number of technologies in a cost-effective manner, producing a depth and breadth of results that no company can achieve alone. We are on our way towards accelerating high-potential innovations, catalyzing investment and increasing awareness of, and support for, important ideas to improve health and save lives. We are thrilled to have you be a part of this transformative journey! IF YOU HAVE A TECHNOLOGY, SCIENTIFIC DISCOVERY OR MEDICAL SOLUTION YOU WOULD LIKE US TO HELP SHARE WITH THE WORLD, CONTACT US.